Chimpanzees are the closest species to humans genetically. Only 1%-6% of their genes are different. Within any species there is genetic diversity, i.e. no two individuals have the same exact DNA sequence. This variability applies to humans and chimps. Thus, there exists a pair consisting of a human and a chimp that will have the smallest number of different (edit: genes) DNA base-pairs within the two populations. One can say that the pair forms an "inter-species genetic gap". Question: What is the smallest estimated inter-species genetic gap between humans and chimpanzees? Is this a fairly accurate picture of the human-chimp genetic distance? Single-nucleotide substitutions occur at a mean rate of 1.23% between copies of the human and chimpanzee genome, with 1.06% or less corresponding to fixed divergence between the species. So if we accept their analysis, ~1% (it says "or less", but elsewhere in the paper they estimate a lower bound of ~0.96%) of the genome difference consists of fixed single-nucleotide differences between species. Small insertions and deletions: On the basis of this analysis, we estimate that the human and chimpanzee genomes each contain 40–45 Mb of species-specific euchromatic sequence, and the indel differences between the genomes thus total ~90 Mb. This difference corresponds to ~3% of both genomes and dwarfs the 1.23% difference resulting from nucleotide substitutions; this confirms and extends several recent studies. So another ~3% comes from small insertions and deletions, which gives around a ~4% fixed divergence between populations. This rough estimate of the fixed genetic distance between humans and chimpanzees is probably a reasonable estimate of the distance between the nearest human-chimpanzee pair. If you also want to know how far apart the two furthest humans are, as @Remi.b mentioned, the populations we've sequenced don't span the whole diversity of our species, but it is likely much smaller. You could look at some of the HapMap or Human Genome Diversity Project papers. For reference, when Watson's genome was sequenced, they reported around 0.1% of the sequence to be different from the reference genome, but that isn't a particularly diverse comparison. You may also be interested in this paper comparing the human, chimpanzee, and bonobo genomes: http://www.nature.com/nature/journal/v486/n7404/full/nature11128.html. The answer given by leekaiinthesky and partially in the comments on the question give a good general picture. I also think that the variation within the respective species is way less than between the species. Keep in mind that also archaic humans like Neandertals fall outside of the variation of present-day humans when you do a genome-wide (nuclear genome and mt-chromosome) comparison (see Briggs et al. (2009) for the mt-genome, and Green et al. (2010) for the first draft nuclear genome and Prufer et al. (2014) for the high-quality genome. Looking at Meyer et al. (2012) you see that even Denisova genomes falls outside of Neandertal variation for whole genomes); this means that looking at phylogenetic trees of either nuclear or mt-genomes, the Neandertal always forms an outgroup, independent from what present-day human populations you are looking at. This is roughly quantified to 1% difference between humans and chimpanzees, 0.2% difference between present-day-humans and Neandertals and 0.1% difference within present-day humans. The latter two seem to be fairly close, but: there are no fixed differences between present-day human populations, and this will blur the differences in intra-present-day human populations compared to the differences of present-day humans and Neandertals or chimpanzees. However, there is one aspect that has not been discussed here which I think is very important for your considerations: trans-species polymorphisms (TSP). In the first part of my answer I was careful to always pronounce that major differences can be observed genome-wide, but genomes have a mosaic structure. When you look at specific parts of the genome, i.e. genes or haplotypes, these major differences do not hold and TSP are a very interesting special case of that. TSP are basically just gene variants, i.e. alleles, that are shared between species. This means that individuals between species might have the same variant, but individuals from the respective same species might have other variants. In simple terms this can be seen as individuals between species are more closely related at a given gene locus than individuals within species. Shared polymorphisms between species can in principal be caused by three mechanisms: (i) Genetic admixture and introgression, (ii) molecular convergence and (iii) TSP by either incomplete lineage sorting or splits in the lineage of alleles that predates the split of the species and both alleles are maintained in both species [Těšický and Vinkler (2015)]. This figure from Těšický and Vinkler (2015) shows the three mechanisms (see the green genealogy for an incompletely sorted lineage and the red genealogy for a lineage with an early allele lineage split). The first two are fairly unlikely in our case, even though there is some evidence that admixture between humans and chimpanzees happened after the initial lineages split [Patterson et al. (2006)]. 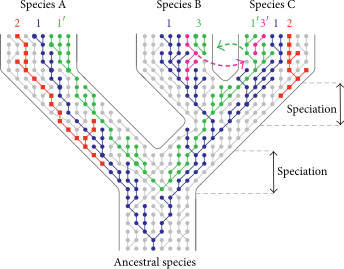 Incomplete lineage sorting or early splits in the allele lineage, i.e. the TSP variants are identical by descent, can be seen as TSP in a narrow sense. And this type of TSP has been described between humans and chimpanzees especially for immune-related regions (see Azevedo et al. (2015) for a review) that are under long-term balancing selection. You can think of this as a selective pressure that is fairly constant in time, acting on different species over a wide geographical range, and triggering a similar selective response in the species involved. Given that, it makes sense that the candidate genes are immune-related as most likely that selective pressure is mediated by pathogens. Azevedo et al. (2015) also note that maintenance of TSP variants by balancing selection is most likely mediated by heterozygote advantage or frequency-dependent selection - both make sense in a pathogen co-evolution scenario. So far, the number of reported TSP loci is really low (really just below a dozen or so), and there might be two reasons for this that are not mutually exclusive: First and obvious, there might be very few TSP. Second, these loci are very, very difficult to detect (as you want to exclude loci that are identical-by-state due to e.g. recurrent mutation) and we might simply not yet have the tools and power to find most of them. To draw a bottom-line and come back to your question, I would suggest that your inter-species genetic gap model needs a minor modification. Even though the general picture seems to fit, i.e. 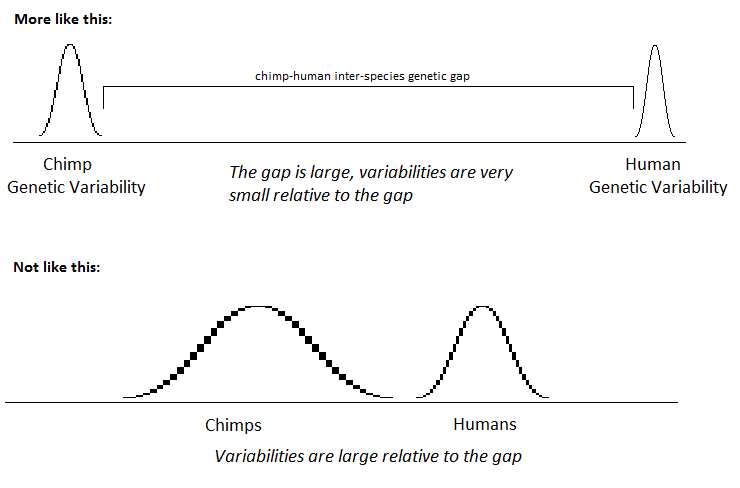 there is a significantly larger difference in variation between species than within species, there also is overlap in the far tails between chimpanzees and present-day humans. These overlapping variants are not identical-by-state, i.e. due to random effects or recurrent mutations, but are signatures of polymorphisms in the ancestral population of chimpanzees and humans that are still maintained independently in both the split lineages. Of the Old World monkeys, the chimpanzee has been the most studied (Socha et al., 1984). Interestingly, they have predominantly blood type A and in rare cases blood type O, but NEVER blood type B (Socha et al., 1984). Most blood systems found in chimpanzees also exist in man, but there are some species specific characteristics. In contrast to chimpanzees, gorillas have been found to possess ONLY blood type B. Now you can use some kind of statistic tool often used to determine genetic distance within species, such as the Fixation index on the genes regulating the AB0 blood system. Using that tool you can say that your genetic distance to gorillas are less if you have blood type B than if you have any other blood type. If you have blood type A your genetic distance to Chimpanzees are less than if you have blood type 0 and your genetic distance to chimpanzees is the largest if you have blood type B. You can do a google image search on "Cavalli Sforza" and find a lot of interesting diagrams where this method is applied to humans. You could in principle do the same procedure on all genes that Chimpanzees and humans shares but the allele frequencies differ and try to find who has the least genetic distance to the present day chimpanzee population. According to a study referenced here such areas in the genome are found in genes relating to fighting off diseases, where you might have an evolutionary advantage if you have a different allele than people around you that catches a disease because your allele makes you immune. Not the answer you're looking for? Browse other questions tagged genetics dna human-genetics mutations biodiversity or ask your own question.